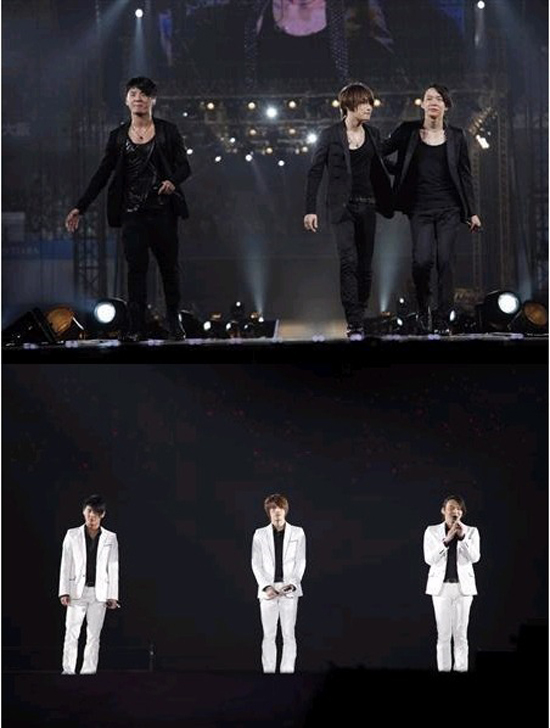 Popular group Tohoshinki on hiatus, has its members Junsu, Jejung and Yuchun for a new unit, and perform in Tokyo Dome for two days ending on the 13th. The 4 day tour attracted around 200,000 viewers. After the last song, Jejung commented “When I cried on the first day in Osaka, seeing everyone want to cry broke my heart. Today here, are you all smiling happily? Smiling, he also said “Since our debut till now, I want to keep my feelings pure and continue singing”, and the three promised that, and couldn’t suppress their painful tears. Last year in July, Tohoshinki had their first Tokyo Dome performance, and after 11 months, they once again stood on that stage. Yuchun said, “In truth, here, to come here again, I was a bit worried. But, because all of you we are here. Really, thank you very much!” Overcoming the problems of disbandment, the three were thankful to be able to gather here again. Junsu also said, “having the Dome filled with everyone, it feels like a dream. I’m really happy”, and as he bowed, he started to cry. ”JUNSU/JEJUNG/YUCHUN THANKSGIVING LIVE IN DOME” presented 4 new songs, including “Itsudatte kimi ni” (For you, always) and “W”, as well as other songs and solos, with a total of 18 songs performed. On the 28th of July, the documentary road movie of the three members’ journey of self-discovery before the new unit was active,“3hree Voices” will be released. Tokyo Dome was dyed with the red color of Tohoshinki. 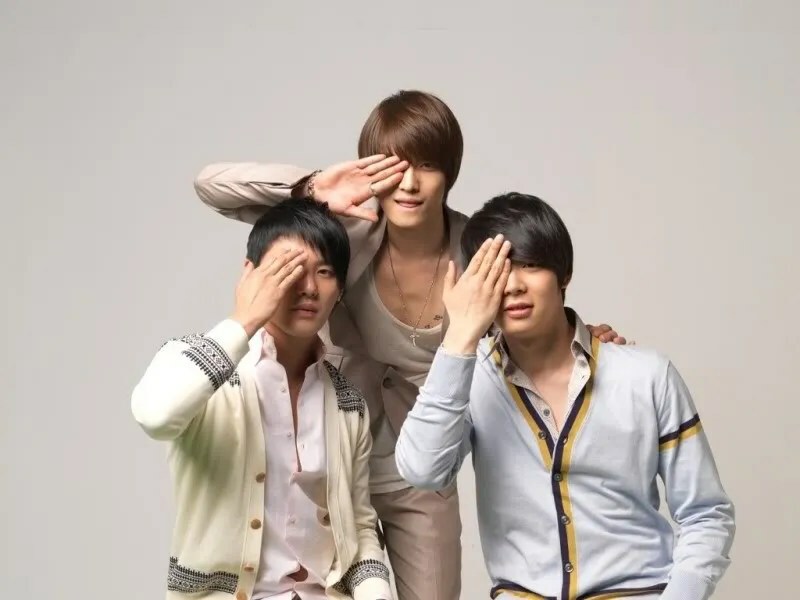 JeJung said with a delighted voice, “Although there are only 3 of us on stage…. The concert’s time is nothing compared to the time that you’ve been waiting for us; but just by being able to see your smiles, this concert has become meaningful,” and being overwhelmed with emotions, he broke into tears. “Honestly, standing on this stage feels like a dream. 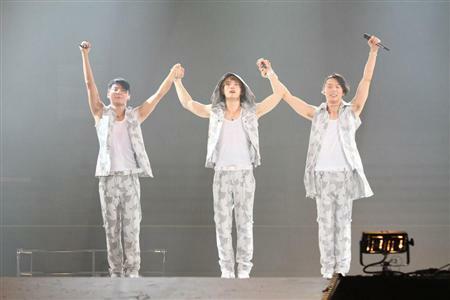 We will keep doing our best not to lose to the love you have for us,” JunSu said and lowered his head. In the end, they started to enthusiastically their new song “W” while wiping away their tears many times. At that moment, the scene of enthusiastic singing has turned into the scene where everyone was crying and sobbing together. The concept of their Dome tour is to convey their gratitude towards fans. Because of their strong hope to “be closer to the fans,” the stage this time is placed in the center, designed with 4 passages to the audience, and equipped with a 11-meter rotating lift and 2 cranes. While singing Tokunaga Hideaki’s “Rainy Blue,” Kome Kome CLUB’s “Kimi ga Iru dake de,” and their new song “Get Ready,” they rode on rail cars to make a tour around the arena. The dome was shaken with screams and cheers as they got closer to the audience. 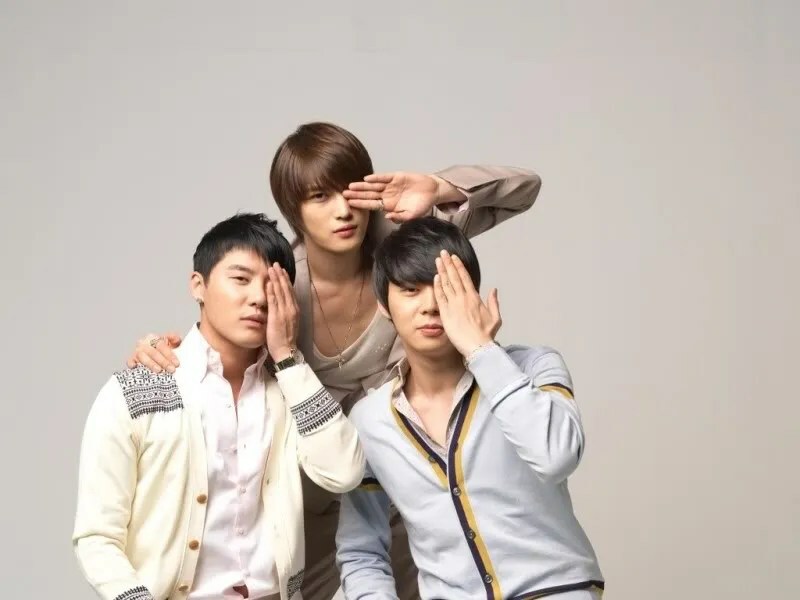 On the 5th ~ 6th of this month, at the fanmeet which was held in Osaka, Japan, the TVXQ trio Xiah Junsu, Hero Jaejoong and Micky Yoochun said, “The year of 2009 was a painful one, reaching the point where we wanted to give up everything.” It’s the first time that they mentioned about their feelings on the dispute with SM Entertainment about their contract. Hero Jaejoong also said, in Japanese, “Even though we would really like to personally convey the truth and our thoughts to the fans, but we cannot do that, and it makes us feel very painful.” “I feel very happy to be able to see the fans once again. Please take more care in the future, everyone.” After all of them poured out their hurt and their innermost feelings, the 3 members sang “I Have Nothing”, “For You” and other songs, and they were also tearing up. That day’s fanmeet is the TVXQ trio’s first official stage as a new unit. Although the individual activities of the 3 members have been official, however, the court dispute with SM is still ongoing, both sides unwilling to give in. 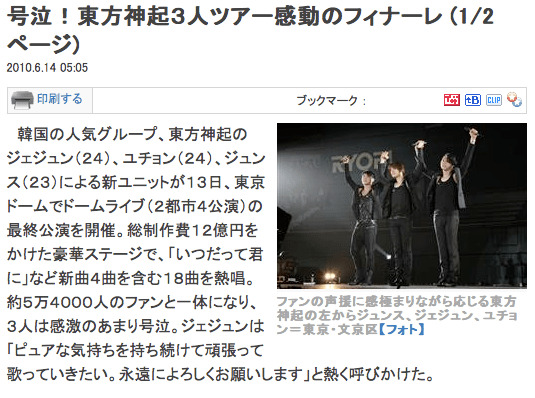 After the Osaka fanmeet, the TVXQ trio will hold another fanmeet at the Tokyo Dome on the 12th ~ 13th of June. 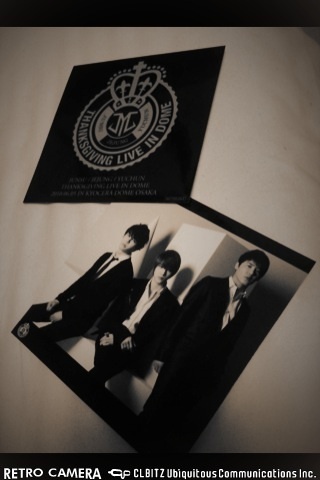 [TRANS] 100606 Junsu/Jejung/Yuchun Dome Concert CD2 Promotion Activity Confirmed! Elizabeth Sakura Narita (エリザベス・サクラ・成田,) (born October 26, 1974 in Tokyo, Japan) is a Japanese-Colombian singer and producer better known as just LISA. In 1999 she formed the Japanese urban contemporary group M-Flo with Verbal and Taku Takahashi. 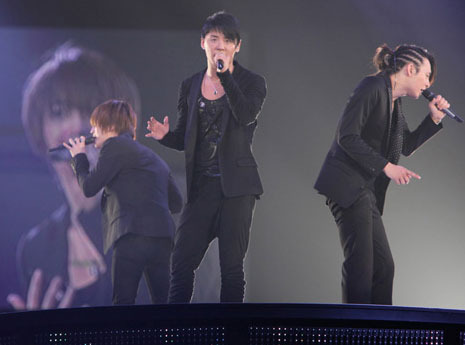 this is still the 3 members Jejung, Junsu, and Yuchun’s Kyocera Dome thanksgiving concert!! setting off the concert to a climax. The huge and perfect venue stunned me! the 3 welcomed me warmly like true gentleman. His smile resembled a mischievious teenager, it really did! Although I didn’t work with Junsu, he was very bright and open-hearted! All 3 of them were very polite, I was so touched! Sweet Korean-styled voice tones, and Yuchun’s smile! They personally checked over the actions on the stage, which made me very relieved! Actually, I was the one who was the most nervous! I kept of waiting for my program. I think they are very outstanding! When they stand on the stage, screams filled the air! I started singing 《Binsorongu, ビーンソーロング》, and screams once again echoed throughout! The stage was super huge! Jejung and Yuchun were really far away from me! Because they are warm people, their fans are equally as warmhearted! Waving our arms together, singing together, I felt so honored! 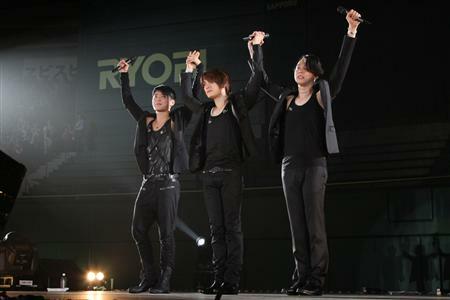 Jejung, Yuchun, Junsu, and all their fans, once again, thank you all! Ah, the last thing I want to say is; Junsu, don’t sing so playfully! The concert was really spectacular! 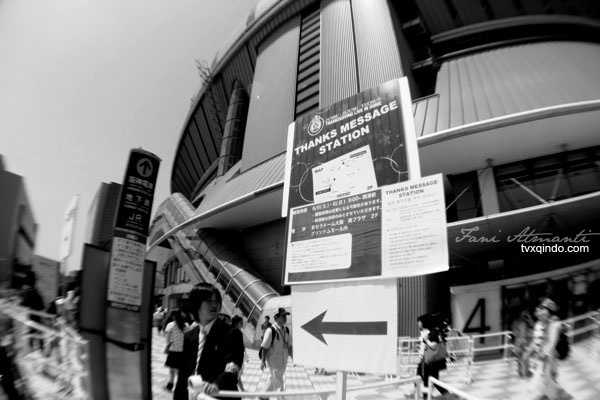 There was a ‘thank you’ message station and also a ‘thank you’ message street. This is for fans who will be attending the THANKSGIVING LIVE. They were given transparent stickers, and they were instructed by the staff to write a ‘thank you’ message using a white marker. 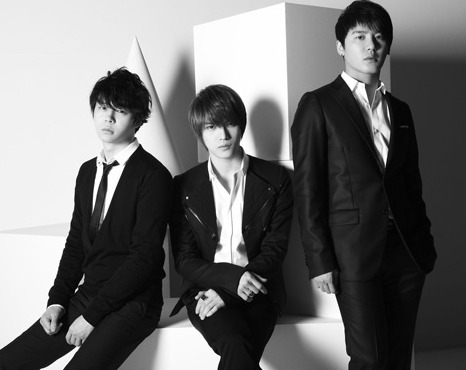 Later, the staff will compile all messages and place them on a black JYJ board. This will be exhibited at the streets. Free stickers were given to the fans before they entered the dome.